Advantages: Totally new kit shares nothing with past DML 1/72 Panthers; no more screw holes! 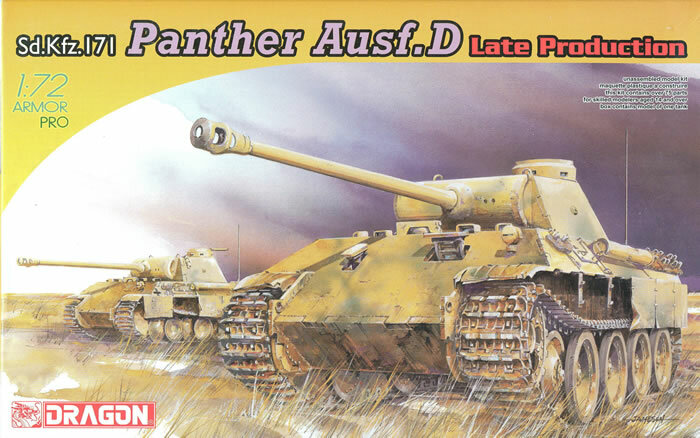 DML has now followed up their very nice early Panther Ausf. D with a late production variant. The difference in the two kits is a new A sprue with several new or modified parts from the first kit. It comes with skirts and most of the details German armor fans associate with early model Panthers such as the gun port in the glacis vice the machine gun ball mount and the stepped hull side profile. The hull consists of three parts - upper, lower and stern plate. The road wheel arms are pre-molded into the lower hull and like past DML Panthers the intermediate road wheels are linked together to speed assembly and ensure accurate fitting to the model. The idler wheel consists of three parts (two castings and an outer ring). The tracks now come as with all recent DML 1/72 scale kits with an indicator that the tracks are to be 182mm in overall length. These measured out at 179 mm so will need a bit of stretching to fit properly and provide for sag. All side details are separate but the pioneer tools and OVM come “bundled” into assemblies for simpler installation. The hull hatches are molded in place and while the “dustbin” turret cupola consists of two parts, it is obvious that it was not designed to be opened so anyone wanting a figure in the hatch has some work on his hands to make changes. Ditto the rear access/emergency hatch. As there are no etched brass parts modelers wanting them will have to either borrow from an earlier DML kit or seek aftermarket parts. Technical assistance was provided by Tom Cockle and Gary Edmundson. Two finishing options are provided: 1./Pz.Rgt. 2, 16th Panzer Division, Russia 1943 (green over sand, red 12); and 1./Pz.Rgt. 24, France 1944 (tricolor with black crosses). A tiny sheet of Cartograf decals is included. Overall this“Gen 2" Panther kit is a nice effort - hopefully someday DML will revisit its earlier Panthers in 1/72 and give them the same effort. Thanks to Freddie Leung for the review sample.